IMOLC have recently discovered that they don’t own the collection of jacks, bombards and bottels that they’ve had on display in the old museum for the past 70 years. They have until the start of March to crowdfund £33000 otherwise the collection will be broken up and sold off. For details, see IMOLC’s blog post. The Watling Court Bombard was found, oddly enough, in a dig at Wattling Court. 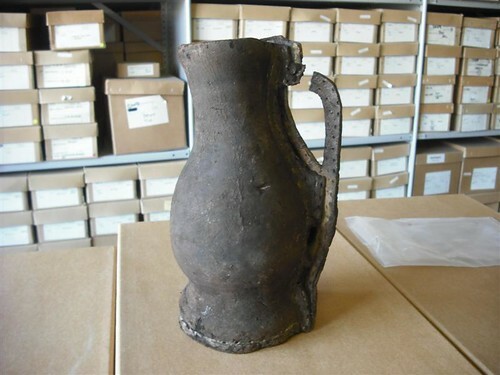 The London Archaeological Archive catalogue gives the dimensions as 240mm high and 150mm wide at the maximum point. Allowing for the handle, that makes it roughly about a two quarts (2.4l), or maybe a little larger. Period is given as 1066-1485 from the find context, from the shape of the body and handle, I’d put it at the later end of that range. A 15th century carving on the Buttery Hatch at New College (pictured in Baker on p91) is a good match. 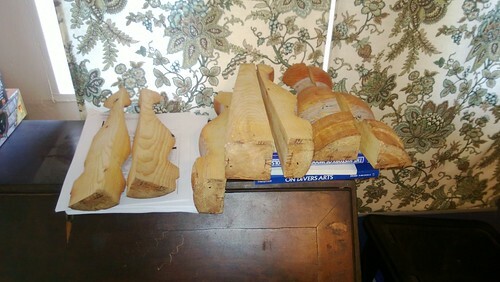 The shape is more globose than the ones I’ve done, but is the sort of shape that lends itself to use of the “puzzle mould” for shaping. I haven’t been able to find any views of the base, so I can’t say how many layers there are between the base and the side. The back seam stitching up through the handle is missing and the welt piece has gone, but there must have been at least one layer in the handle and back as well. I give in. I’m only about 2/3 of the way through the Scottish National Museum photos and I just can’t face them at the moment. So working backwards from the end of the trip instead, here’s a gallery of leather objects from Cotehele House in Cornwall. 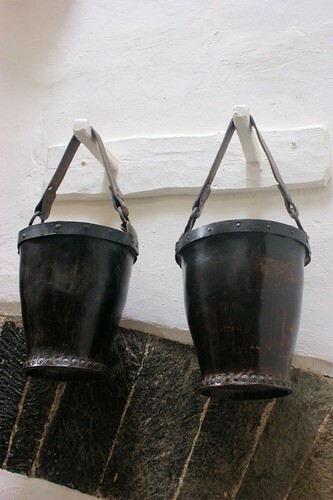 A pair of eighteenth century leather fire buckets in the kitchen. Riveted construction throughout, the top band is thin metal. 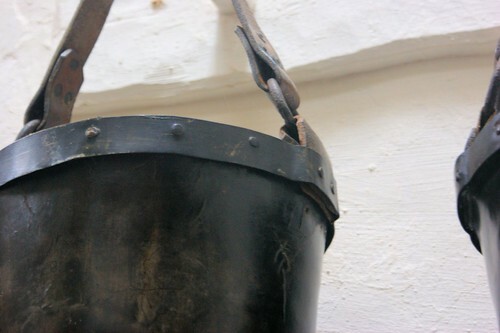 Similar buckets are in Fort Nelson from HMS Invincible, Cawdor Castle and on HMS Victory in Portsmouth. Close up of base and the method of riveting. 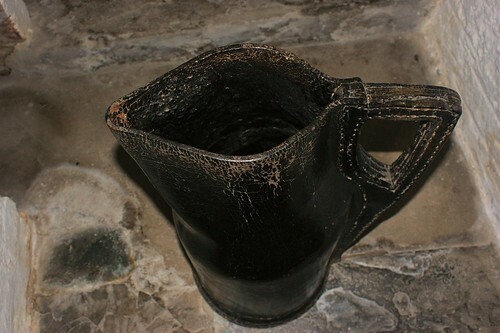 Unlike the Mary Rose buckets, there is no welt. I’m sure I’ve seen that pattern of rivets somewhere before. Detail of the top bands showing how the handles attach. Large Black Jack/Bombard that was in the punch room when we visited. The style dates it to the first half of the seventeenth century, it stands really roughly 20″/510mm high when measured to the nearest knee. There are four layers in the handle. 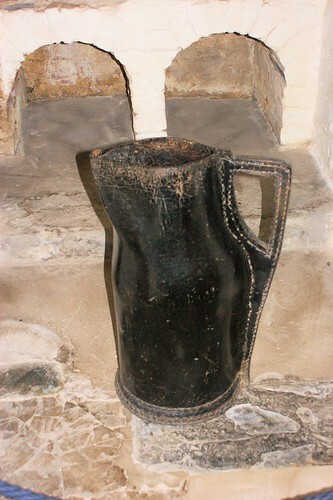 This bombard has a really nice shape around the spout, it looks like it only had very light use and has been looked after. I’m sorry I don’t have any more information about it. I saw this one the other day and thought it made a great alternative for those who don’t want to muck about with paint. Obviously the punch work could have been done any time in the past 350 years but the letter forms and abbreviation are consistent with the restoration period through to the early 18th century. If the decoration were done earlier in the 17th century, the initials would have been I.C. 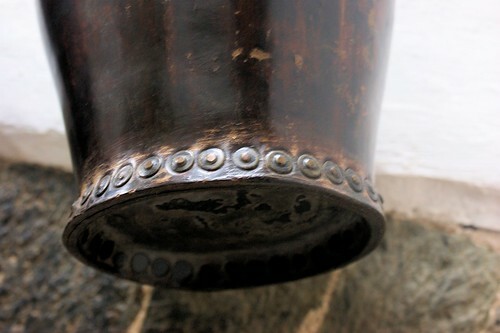 The shape of the jack is also consistent with a date from the middle of the 17th century. An English Leather Bombard, 17th Century of typical form, the front punch dotted with the owner’s initials Rev’d J.C.
We’re back from Blighty and only have 8,000 photos to sort. Galleries get consistently high scores on this blog, so I’ll do a few more soon but here’s an amusing tale to tide you over. Originally planning to visit Tewkesbury, we were put off by the B&B owner the night before. So on a late change of plan, we were visiting Cirencester instead and had decided to do a circuit of the town before parking and going to the museum. 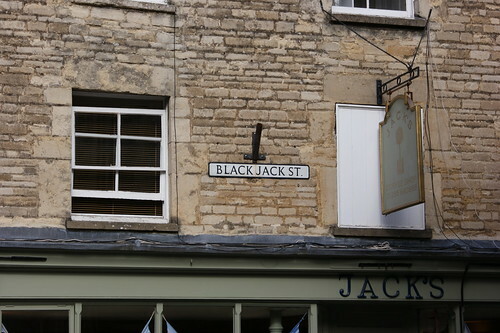 On the way through, we passed this street and I nearly made a flippant comment about the name being some sort of omen. Jack pictured having a picnic lunch at the amphitheatre while the bestiaritrix exercised their dogs. The bloke wanted £25 and sort of tried to imply that it was an original. I’m 95% certain I’m now the proud owner of a Beabey jack that has only been used a dozen times. There was a slow leak due to a bubble in the pitch lining where the handle and base meet, but I fixed that earlier today. I’m sure there’s a moral in the story about signs and wonders somewhere but I’ll leave that as an exercise for the reader. 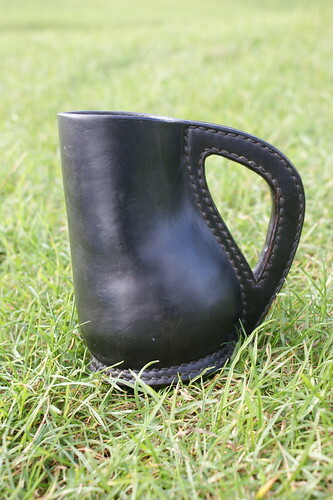 We got back from Blacktown Medieval Fair last weekend and one of the early jobs (other than hanging the canvas) was to see what damage had been done to the leather vessels. They always end up with hairline cracks from use, sometimes the seams will weep and sometimes you get a dark, damp patch spreading from one spot on the surface. The easiest way to fix these is to pop them in the oven at about 60-70° C for three or four hours and then let them cool down in the oven. There’s a pizza tray under the newspaper so the wire oven shelf doesn’t get imprinted in the base of things. The gyspen in front was resealed, as was the costrel. The taller bottel, however needs to be cleaned out and resealed properly. It was knocked over a couple of times and I did see two people reach over, pick it up and squeeze as hard as they could. Watch the temperature, leather is a natural polymer, with collagen fibres linked together with the tannin. 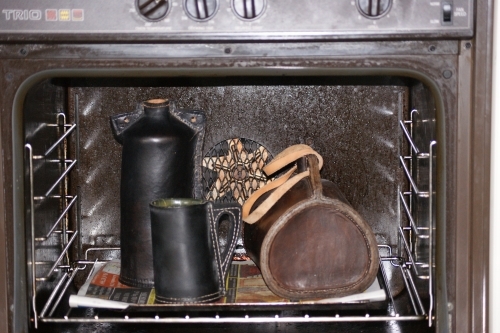 Putting too much energy in by overheating will drive more polymerisation, resulting in leather that is brittle and can shatter if hit. John Waterer in Leather in Life Art and Industry (pp35-6) states that jacks and bombards were hung in the smoke from the fire to cure. I reckon this is a slightly more gentle version of the same treatment.